St. Jacobs/Waterloo, ON, December 14, 2017 – Manufacturers Automation announced that CARLO GAVAZZI has launch their latest motor thermistor relay in a compact, DIN-rail mount housing. The DTA04 features universal input voltage, giving it flexibility to be installed in a variety of control panels. This is a DIN rail mounted thermistor relay whose main purpose is to protect electric motors from overheating, ensuring continuous production and preventing machine downtime. Simplicity, versatility, and reliability are crucial for most users as they select monitoring controls to protect motors and equipment. The DTA04 meets these criteria with key features that include an operational mode that can be configured as Auto or Manual reset, giving the user the ability to select the option that best suits their requirements. The universal input voltage and multiple NEMA B300 relay outputs also provide users with the options they require. The DTA04 gives Carlo Gavazzi more thermistor relay housing options than any other manufacturer, to meet more motor protection applications. The DTA04 conforms to global standards such as UL 508, CSA C22.2 and EN 60255-6, and can be used globally in all applications/markets where motors are used and overloads are frequent and and may cause motor damage, such as pumping stations, water treatment, conveyors, material handling, HVAC, chillers, and others. 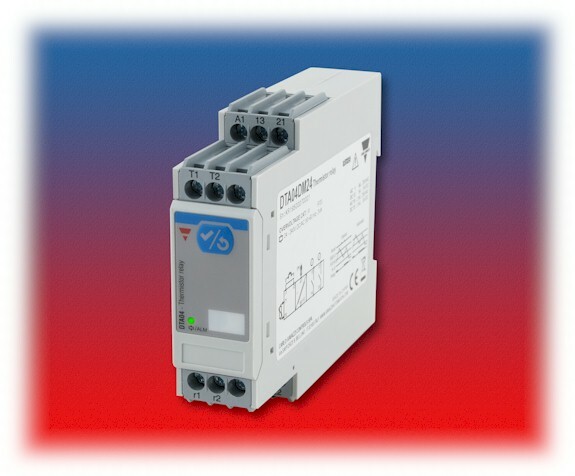 The DTA04 Motor Thermistor Relay is available from Manufacturers Automation Inc.